The BBC's Sanjoy Majumder watches as protesters from the Gujjar tribe in India block roads into the Indian capital, Delhi, as part of their demands to be included in affirmative action quotas for education and state jobs. "Stop killing innocent Gujjars," shout a group of a few hundred protesters squatting in the middle of a key highway leading into Delhi from the eastern state of Uttar Pradesh. The eight-lane expressway, a major entry point into the capital and used by tens of thousands of commuters every day, is completely empty. 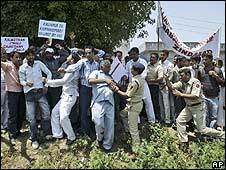 A row of policemen, batons and shields on hand, watch from a distance as the protesters burn an effigy of the chief minister of Rajasthan, Vasundhara Raje, and then lay about it with sticks. Emotions are particularly high after a Rajasthan government crackdown on similar protests in the state last weekend. "Forty of our comrades were killed, taking bullets in the head. Even the British were not this brutal when we were fighting for our independence," says the leader of the protesters, Joginder Singh Awana. 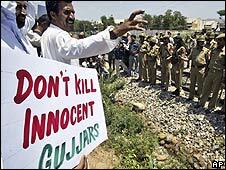 "The entire Gujjar community is angry. We will not leave from here until our demands are met," he adds. "When a terrorist is killed by the police, the courts and human rights groups are all over the place, ordering an investigation and saying their rights have been violated," says one of the protesters. "When us Gujjars go on protest to demand what is our right, the police open fire and no one says anything. What do you expect us to do?" Some of the protesters head off for a nearby market. Sticks in hand they warn shopkeepers to pull down their shutters. "Close all the shops. Nothing will stay open today," they shout. From early on Thursday, the police and security forces have been on high alert across the National Capital Region, making up Delhi and its suburbs. There is particular concern at the upscale suburb of Gurgaon south-west of Delhi, home to many IT companies and international businesses. Traffic is especially thin on National Highway 8, which leads into Gurgaon from Rajasthan and onwards to Delhi past the international airport. Many commuters and travellers have stayed home after advisories published in the daily newspapers, asking them to check with the police about the state of the roads before venturing out. Across town in the south-east lies the Badarpur border, one of the busiest crossings into Delhi. It lies on the highway connecting Delhi to Agra, home to the Taj Mahal. It is also used by trucks bringing in supplies to Delhi. Between Badarpur and Gurgaon are several villages with large Gujjar populations. The police have been busy at night - stopping anyone from leaving the villages and in some instances, detaining community leaders. Still, some protesters manage to sneak out. It's a cat and mouse game. 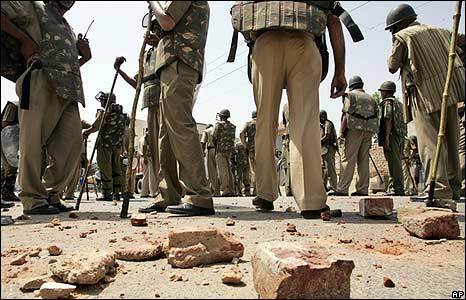 "We are expecting several hundred demonstrators to gather here shortly," says police official Balwant Singh at the helm of a police team at Badarpur. "But we are prepared for them," he says jerking his head in the direction of his men. All of them are kitted out with riot gear. Significantly, very few of them are armed. "Our orders are to allow the protests to go ahead and then we will ask them to leave," says one policeman on the condition he not be named. "We may have to use some force but there will be no firing, no use of arms." Clearly the government is anxious to avoid a repeat of last weekend's violence in Rajasthan. But the protesters are a determined lot, so even if there's no violence in Delhi, the outcome elsewhere might be quite different.